Please scroll down to read all of the information below. I am extremely honored and excited to have the opportunity to teach your child this year. Thank you for allowing me to be a part of his/her education. Advanced English 8 provides students with an opportunity to analyze and evaluate the social, cultural, and civic concerns expressed in the literature they will encounter during four units of study: The Art of Storytelling, Learning from the Past, Making a Difference in the Present, and Learning through the Experiences of Others. Throughout the year, students read and examine texts from a variety of genres, and learn to prioritize, organize, and retain key concepts and information. Additionally, students write often for a variety of purposes and audiences. They examine the structure of their own writing with their peers and their teacher. Regularly scheduled writing conferences with the teacher enable students to analyze their own writing needs and set goals for improving their grammar, usage, mechanics, and organizational skills. Through this procedure, they improve their ability to write clearly and concisely. In addition, students continuously revise and edit their work as they build their writing portfolios. In Core English 8, students learn to compare their own experiences and feelings to those of characters in literature and to write about their observations. Through this experience, students recognize the emotions they share with other young people and adults and identify ideas, opinions, and actions which differ from their own. Through frequent writing in a variety of forms and from many points of view, students strengthen their ability to reason and think critically about their own ideas. Throughout the year, students continuously revise and edit their work as they build their writing portfolios. *If off site (at home, on phone, ipad, chromebook, etc) they will be promoted for their school user name and password. Independent Reading: Students should be reading at least 20 minutes daily. Our school library opens at 8:30 a.m. daily (unless specified otherwise), students can borrow books from our classroom library, and e-books are posted on student Edmodo accounts for their convenience and use. I will never give "busy" work. In order to be ready for the next day's lesson, homework is vital to your success. In addition to reading at least 20 minutes daily, purposeful homework will be provided (on an as needed basis) to practice, extend, and reinforce skills taught in class. Homework is checked daily and is averaged into your grade. Have your homework out and ready to be checked before I arrive at your desk. 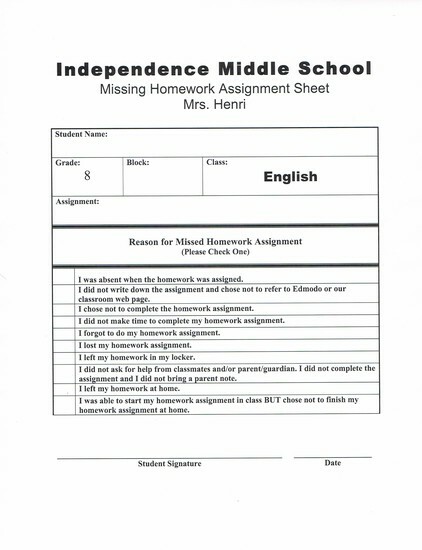 If you come to class without your homework, you must complete a "Missing Homework Assignment Sheet" (see picture below) that is kept in your student file for student/parent/teacher review. When you are absent, it is your responsibility to initiate contact with Mrs. Henri to make up missed work. Arrangements for completing missed work should be made within five school days of your return to school. Full credit for late work will not be given; unless, you have an unexcused absence. Most of our assignments can be found on our classroom web page and Edmodo. Therefore, you can check assignments when you're absent (from the convenience of your home) to keep you caught up with the rest of the class. Upon entering our classroom, you will have an essential task--the warm-up. Begin the warm-up before the tardy bell rings. Do not waste time entering our classroom talking or socializing. If you have an unexcused tardy, you will not receive warm-up points. Our time is very limited, and there is always a great deal for us to achieve. Therefore, you are expected to take care of any personal business (bathroom, locker, etc.) before you enter our classroom. This is not just a responsibility issue but a safety issue as well. A signed planner is required to leave the classroom and no student will be excused during the first ten and the last ten minutes of class. Parents, if a medical condition exists that requires bathroom visits or any other visits that require needing to leave the classroom, please contact me personally so that I can be alerted to your child's needs. Book bags, gym bags, hats, and cell phones are to be kept in your locker; unless, Mrs. Henri specifies otherwise. For example, we may use cell phones from time to time for surveys and research. Sharpen pencils and gather the necessary materials for the lesson. Your textbook, planner, novel, sharpened pencils (extra lead--if using a mechanical pencil), and Reader's Notebook should be the only materials on your desk; unless, Mrs. Henri has specified otherwise (on the board). *An app for Edmodo is also available to use on your smart device(s). View the video below created by an Edmodo teacher, Travis Monk, to see how you can get the most out of your Edmodo student account. Parents: Edmodo is for you too! Please start at edmodo.com. Then, please watch the video below (created by a high school Physics teacher on youtube) to follow the steps for signing up for your Edmodo parent account. Once you are signed up, you will be able to see all of the activity that pertains to only your child regarding what we are working on in our classroom. *An app for Edmodo is also available to use on your smart device. ClassDojo helps me manage my classroom and allows me to give behavior feedback to parents and students. Students will be given their ClassDojo code and their ClassDojo parent code during the first week of school. Parents, you will use the parent code that your child brings home to log onto classdojo.com. *An app for ClassDojo is also available to use on your smart device. Please watch the video below created by educator, Debbie Rice, to get a brief overview of how ClassDojo will be used. Parents and students, please do not hesitate to contact me if you have any questions and/or concerns. I will also use Remind so that we can connect to one another--via text messages--outside of the classroom. To sign up for remind, follow the instructions below on your phone. Bell 3: To receive messages via text, text @g4dkbf to 81010. Bell 4: To receive messages via text, text @888g4 to 81010. Eagle Enrichment: To receive messages via text, text @eagleenric to 81010. Bell 6: To receive messages via text, text @ff82e to 81010. Bell 7: To receive messages via text, text @dcfk2 to 81010. Grading for our classroom: The total points system will be used. · The grade is determined by dividing total earned points by total possible points. · The number of assignments and the number of points will vary. For example, tests will be worth more points than assignments such as homework and classwork. However, it is very important to note that ALL assignments should be considered important, because while tests and quizzes will be worth more points, many other assignments worth less points will produce just as many or more points. I believe it is essential to integrate technology to assist students in gaining the necessary skills to survive in our highly complex world. I also believe that our planet is a very important place and we should do as much as we can to reduce the use of paper in our every day lives. With that being said, we will use a great deal of technology in our classroom! Google Classroom is a technology tool that students will be using this year to submit their work. One component of Google Classroom is Google Forms, which allows me to have real-time data to create targeted interventions to assist your child in mastering each learning target. Also within Google Classroom is Google Docs, which enables me to provide your child with instant feedback at any time during his/her writing process. Students can also share their documents to collaborate with their peers. I have included a video below (created by Albert Church) that provides a general overview of Google Classroom. All students have a Google account provided by the district. Most importantly, PARENTS--you can also keep up-to-date with your child's work, as you will also be able to see your child's progress at any given time (including real-time). To do so, you will need to keep a record of your child's Google username and password, which I recommend each parent do regardless. Please do not hesitate to contact me if you have any questions and/or concerns. I look forward to working with you. Thank you!